I only ever read the first one but want to read more of them. I understand this though Ive done it with a few series myself where I have loved it, then suddenly stopped mid series and not picked it up again. A series really has to stay compelling all the way through for me to read them. Meet New Yorker Boris Yellnikoff (comedy great Larry David): a sarcastic, bitter and brilliant misanthrope who almost won the Nobel Prize. Boris, admittedly, is not a likeable guy. That is, until he meets Melody St. Ann Celestine (Evan Rachel Wood), a charmingly naïve runaway who finds shelter on his doorstep. As he lets her into his home and his heart, he discovers that in this cruel world sometimes it's worthwhile to get a little happiness doing Whatever Works. Director-writer Woody Allen returns to his comedy roots in this poignant and wildly hilarious romp that Gene Shalit of "The Today Show' calls "Colossally funny!" It was my turn to select a movie to watch in the theatre. I have chosen this one not because it is a Woody Allen movie, but because I like both the stars and I was curious. I enjoy watching Larry David on Curb Your Enthusiasm and I could really imagine him working in a Woody Allen picture. I enjoyed Evan Rachel Wood's work since I first saw her on the series "Once and Again". She was only about 11 at the time, but she already was a great actress. Much better than most child stars. The most recent movie I saw with her was "The Wrestler". 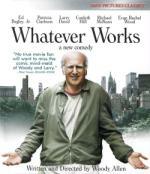 "Whatever Works" is a really funny movie and both the stars did not disappoint. They were terrific. This movie was also well received with the group I dragged into it. Personally, I like Woody Allen's movies much better since he stopped acting in them. Whatever Works is on my wishlist mostly because Evan Rachel Wood supposedly gives a performance quite different from her previous ones. BTW, if you like her, I can also recommend Across the Universe, Thirteen and Down in the Valley (in that order). I personally never could get along with the Woody Allen movies... something about him just bugged me. BTW, if you like her, I can also recommend Across the Universe, Thirteen and Down in the Valley (in that order). I have Across the Universe but I didn't really enjoy it. Maybe I will have to give it another chance someday. Thirteen I have bought a few years ago because of Evan Rachel Wood, but I never came around to watch it for some reason. Ill have to take a look at those films Matthias thanks! Pete, I think alot of people are annoyed by the way he talks... he talks alot and very fast, sometimes it seems irrelevant, he sound whiny. Some of my favourite quotes are in Annie Hall... of course one is courtesy of Groucho Marx "I would never want to belong to any club that would have someone like me for a member." ...Of course coupled with all those things I said about him above, and this just makes me laugh every time I watch the film. "The... the other important joke, for me, is one that's usually attributed to Groucho Marx; but, I think it appears originally in Freud's "Wit and Its Relation to the Unconscious," and it goes like this - I'm paraphrasing - um, "I would never want to belong to any club that would have someone like me for a member." That's the key joke of my adult life, in terms of my relationships with women. " Ive shown a few people Annie Hall, they either get it or don't get it... I think its the type of film you either love or hate. For Across the Universe, I did post a review here once. That's interesting Emma, I've seen Annie Hall and neither loved nor hated it. While I didn't think it was anything amazing I also enjoyed it somewhat. I think Annie Hall is the type of film that you can relate to if you have ever been in a relationship that reflects the one Alvy is in, sadly it does infact reflect my relationship with my ex pretty much identically... although Im more Alvie and hes more Annie, haha. Is that not the case with every single film though? I think a person can relate to any film or TV show better if their situation reflects that or is similar too that of the plot. Not necessarily.... films are generally written to focus on the widest audience possible, Woody Allen is said to have written Annie Hall as an autobiographical story of his relationship with Diane Keaton, and so it was more of him trying to tell his story, then a story. I haven't seen many Woody Allen movies. I am not particurarly a fan of him. I have seen "Everyone Says I Love You", "Sleeper", "Mighty Aphrodite" and "Melinda and Melinda". The first I had bought because of Drew Barrymore. I don't remember much about the film. I will have to revisit it again someday. "Sleeper" sounded interesting but did disappoint me. I bought "Mighty Aphrodite" because of Mira Sorvino. But the movie was just okay. And "Melinda and Melinda" is an average comedy I enjoyed somewhat. As I said I did not choose "Whatever Works" because of Allen, but because of its stars. And I am glad I did. I know that many films are aimed at a wide audience, all I'm saying is the reception context will always obviously be different for a person if they have a similar story to a film and can relate to it.